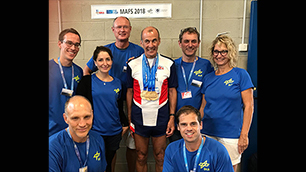 Jörn Rittweger, lead investigator in the MAFS study, DLR Institute of Aerospace Medicine: "I was most impressed by the athletes' various life stories. Their performances are astonishing, and for that they deserve the utmost respect. But when you learn the backstory, you can't help but be impressed. Although strenuous at times, our work was also very worthwhile: in just two weeks, we collected an immense volume of high-quality data that we would never have been able to obtain by other means. I think we will use this opportunity again in future when we need reference data for ISS experiments. We were also able to test new data collection methods. All in all, we are thoroughly delighted with the outcome of the study." Jens Tank, echocardiography and pulse wave analysis station: "I regret that I was only able to join the study for the last three days. Originally I was sceptical as to the value of a field study, as the quality of data is frequently not the best. But I was quickly convinced otherwise. Despite the extremely cramped space and the tropical conditions, Fabian Hoffmann and Stefan Moestl managed to perform over 160 excellent heart ultrasound examinations and determine the biological vascular age using a new method to measure blood pressure on the upper arm, which makes it possible to estimate the central blood pressure in the aorta, as well as to identify the aortic pulse wave velocity. I am particularly grateful in this regard to Siegfried Wassertheurer from the Austrian Institute of Technology in Vienna and Bernhard Forreiter from GE Health Care, who assisted us with the technical equipment. The perfect organisation of procedures by the team under Prof. Rittweger was especially fascinating, from the scheduling of appointments to paperless data collection, printout of summarised findings for the athletes and a final consultation. 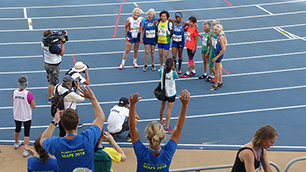 The special atmosphere of a world championship event for ageing athletes that pervaded the whole event was quite simply the icing on the cake. This was doubtless one of the reasons why everyone involved managed a fantastic final spurt for the finishing line towards the end of the study – although fatigue was obviously taking its toll here and there. I will certain earmark additional time for the next event, and will definitely exercise more in the meantime as well." Phil Chilibeck, Professor in Kinesiology, University of Saskatchewan, Canada: "I really enjoyed working on the field study with DLR. I've met some amazing athletes who provide much motivation, showing that it is possible to overcome the barrier of aging with proper exercise training. It was a pleasure to work with a broad range of people with different backgrounds and expertise in different languages. I had the opportunity to speak French with French athletes – a skill I was taught through school but do not have the opportunity to practice much. I am working on the study mostly with echocardiography measurements, assessing heart structure and function. The doctor performing these tests (Fabian Hoffmann) is very skilled at these assessments and is providing not only valuable research data on how the heart changes with ageing and with high level exercise training, but also providing research participants with valuable information on an important aspect of their health." 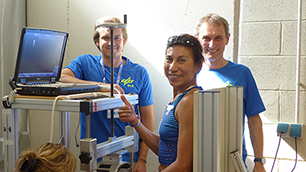 Petra Frings-Meuthen, resting metabolic rate station: "When I arrived for the second week of the study, I found that the team (Natia Rittweger, Irmi Schrage) was in great spirits and already working like clockwork. It didn't take five minutes before I was in the thick of things. The first participants of the day usually came to our station, as the athletes were not allowed to have breakfast or exercise before completing the resting metabolic rate examination. Our instructions to the athletes were simple: "Don't talk, don't move AND don't sleep for the next 25 minutes," whereby the last one was trickiest of all. But after 25 minutes of quiet resting, we were able to release them from the ardours with a cheery call of "Breakfast!" The volume of data that we managed to collect is far larger than I expected, and I am really looking forward to analysing it with my colleagues and to learning more about this special clientele of Master athletes. One thing is already certain: from now on, all of us will exercise a lot more to stay just as fit and beautiful as our participants at MAFS18!" Wolfram Sies, DLR Institute of Aerospace Medicine, responsible for technology, organisation and troubleshooting: "I spent my time running from place to place, although I mainly helped out at the calf muscle ultrasound station. I was particularly fascinated by the athletes' ambition; it was like they were competing against themselves, and everyone wanted to get better in each measurement. We were almost overwhelmed by the number of participants, and it was great to see how inquisitive and communicative they were. There were lots of interesting and funny conversations." Christine Becker, DLR Institute of Aerospace Medicine, responsible for organisation and registration – and the woman with X-ray vision: "I was deeply impressed by the team and its energy: although the days were very long, everyone remained completely committed. Not just the participants, the MAFS team was also international and still managed to bond quickly. 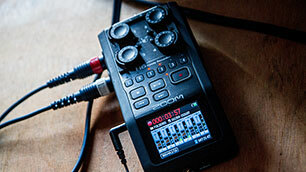 Everything ran smoothly and very harmoniously. And whenever a spontaneous adjustment to the schedule was necessary, each team member was willing to jump in and help out. We always managed to overcome the language barriers by working together as well."